One of the most requested dips I make at family get togethers is my Spinach & Artichoke dip. It's warm, cheesy and addictive, especially with warm slices of bread or toasted crostini. But rather than bringing the same dip served the same way, I wanted to switch things up a bit. This time around I made a Spinach & Artichoke Cheeseball that was definitely a bit hit at my Chicago Deep Dish Pizza Showdown party. It's all the deliciousness of a spinach and artichoke dip all rolled up in a ball - literally! 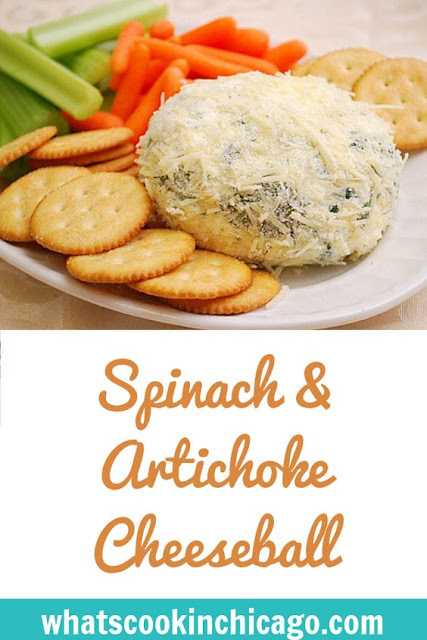 As one might assume, this Spinach & Artichoke Cheeseball has both spinach and artichoke. 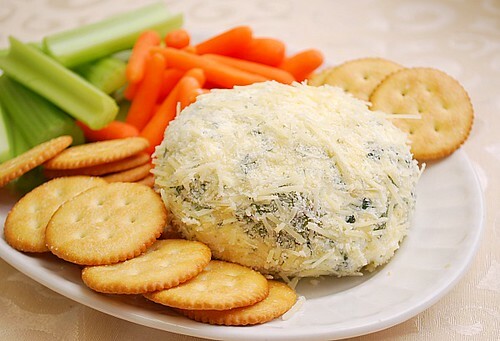 To hold it together, a mixture of cream cheese, mozzarella cheese and Parmesan cheese makes this a definitely cheeseball. But the secret, in my opinion, is the dry ranch dressing mix. It brings a subtle ranch flavor that really goes well with all the other ingredients. In a large bowl, combine the cream cheese, spinach, mozzarella cheese, 1/4 cup of Parmesan cheese, artichokes, garlic and Ranch dressing mix. Mix together with clean hands until well blended. Form into a ball or log and coat in the remaining 1/2 cup Parmesan cheese. Chill for at least 1 hour. Place on a serving plate and serve with crackers and/or vegetable crudités. I think I'll be making this one! Ooooh, I love anything that's spinach and artichoke. I once made the dip in a large bread bowl for my sister's bridal shower and I think I probably ate most of it. Will definitely have to give this recipe a try.